Over the course of this year Europe has been rocked by a wave of protests, occupations and direct actions demanding greater equality and a more participatory democracy. Inspired by the ‘Arab revolutions’ and in response to the deepening economic crisis, this movement began to take form in May, with mass protests by the Indignados in Spain. Since then it has rapidly spread throughout Europe under the banner of ‘Occupy’. With demonstrations in Portugal, peoples assemblies in Amsterdam, riots in Rome, strikes in Greece, direct action against banks in England and occupations all over. 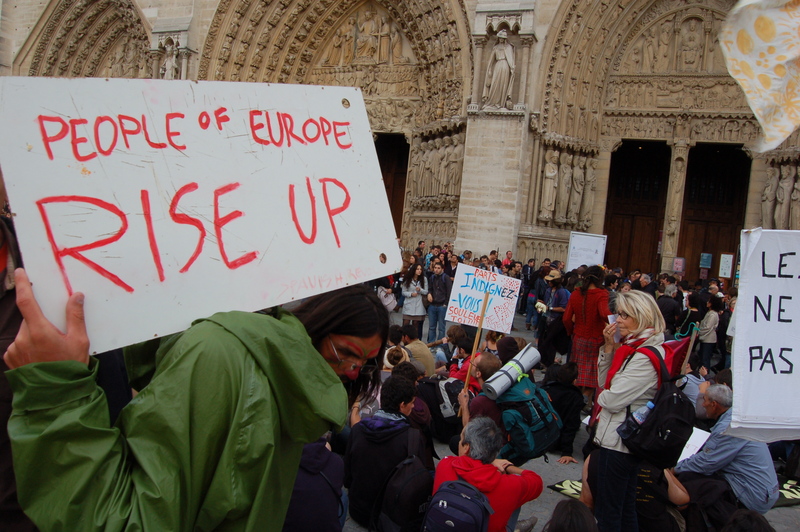 Helene Zuber argues in her article for Der Spiel that we are seeing a “fundamental change taking place as a European generation takes to the streets.” This global movement characterised by the politics of people’s assemblies and occupation is referred to using different names in different places, such as the Indignados, Real Democracy Now, M-15 or Occupy movement. It has come to represent the sentiment for change across Europe and the widespread feeling that democracy has lost its way and needs to be reinvented. The rapid growth of this protest movement is directly related to the economic and political crisis. In England basic services are being cut, in Spain unemployment sits at 21%, Ireland was bailed out by the IMF and corruption is rife in Italy. The Eurozone is now facing the very real possibility of collapse, with many commentators predicting that Greece will have to default and leave the single currency. Economically, the European Union has always been a neo-liberal project, following the free market agenda of privatization, deregulation and cuts to government spending. Yet this project is failing, growth has stopped, debt is growing and the region is being dragged back into recession, in what the guardian describes as “the European economic nightmare”. Spain is one of the counties most affected by the economic crisis and this movement started there on the 15th of May, when a group of 100 protesters decided to start an occupation in Madrid after a protest calling for Real Democracia Ya (real democracy now). Yet in the early hours of the morning they were violently evicted by police, with several arrests and injuries. The police brutality only strengthened the protesters’ resolve and a call to retake the square spread rapidly across the internet. The next day thousands of protesters returned and reoccupied the square. I arrived late at night when the camp was still under construction, with tarps, megaphones, chairs, beds and everything you can imagine coming out of nowhere to build an anarchic structure in the centre of Madrid. Over the next week a radical transformation took place; the space became a kind of liberated zone and its own world. Every day more people joined the occupation and the camp continued to grow, with between five and fifty thousand people occupying the square at all times. The mainstream media began referring to it as ‘the republic of Sol’ and the ‘Spanish Revolution’. Kitchens were set up to distribute free food, the main billboard was covered in the words ‘Europe Rise Up!’ and ‘peoples’ assemblies’ were held almost constantly to decide the direction of the movement. The occupation movement started in the capital, but spread rapidly across Spain, within a week similar occupations had started up in over 20 cities and towns. In June the Spanish movement started multiple marches from all corners of the country towards Madrid; the capital, geographic heart and epicentre of the movement. One of these marches, the Eastern route from Valencia was over 500kms long and lasted 34 days. It passed through 29 towns and cities, where ‘popular assemblies’ were held to listen to peoples demands. Toni, one of the walkers explained that “the idea behind the marches is to bring the revolution to every part of the country, especially the small villages and towns.” The different marches arrived in Madrid on the 23rd of July and a massive meeting of the peoples of Spain was held. 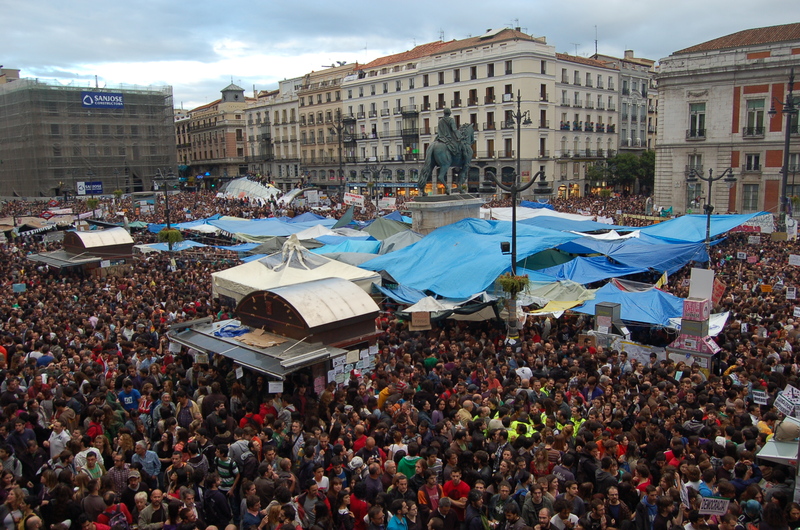 Tens of thousands of people reoccupied the main square in Madrid and for several days, popular assemblies and workshops were held around the clock. This national meeting was part of an ongoing process that is trying to link the different occupations and assemblies together. A decision was made to take the struggle to the centre of European power, and when the conference finished a few hundred people set off on foot to Brussels (around 2000kms away), continuing what one of the walkers described as “the modern hippie version of Mao’s long march”. Over the course of this year millions have taken to the streets of Spain demanding a more participatory democracy and greater social justice. Occupations began in all major cities, the parliament was blockaded, mass demonstrations were held and everywhere people’s assemblies were formed in an attempt to create a new direct democracy. After months of mobilisations and occupations across the country the people decided to leave the squares and expand the movement at the grassroots level through the establishment of ‘Assemblies of the Suburbs’. In Madrid alone more than 40 separate local assemblies have been set up, which each hold weekly meetings in public spaces to deal with local problems and organise actions. By the end of May the movement had already began to spread. Syntagma square in Athens was occupied for over one month and on the 31st of May an estimated 50,000 protesters surrounded the parliament, blocking the politicians and holding a massive people’s assembly in the streets. Every day people returned to the streets to take part in mass protests, people’s assemblies and occupations, culminating on June 5th when around 200,000 people demonstrated for change. 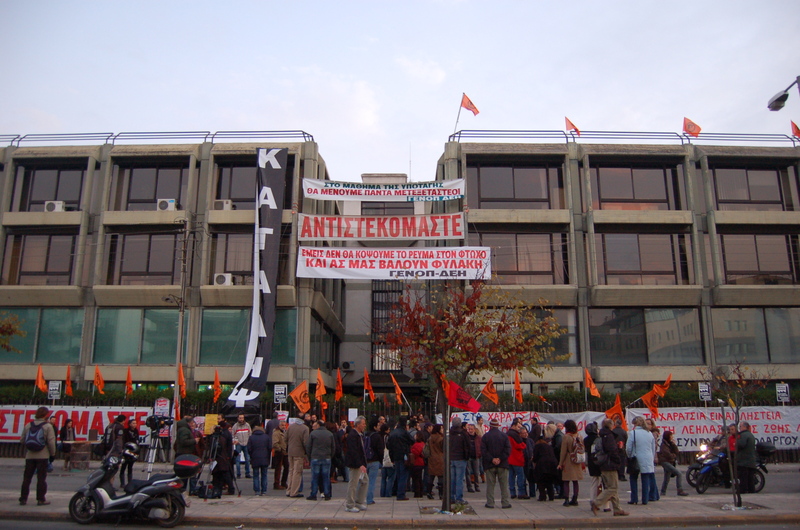 The Greek indignados movement was directly related to the country’s economic crisis and the harsh austerity measures imposed by the IMF and EU. These included massive wage cuts, privatization of the nation’s assets and drastic cuts to social spending. Yet the indignados movement is just one of many radical movements for change in the country which has some of the strongest organised resistance in Europe. For as Costas Douzinas argues in the Guardian, “the Greek people have with their protests over the last 18 months turned Greece into an ungovernable country”. The situation is becoming increasing revolutionary; ‘committees of struggle’ have been set up in workplaces, seven general strikes so far this year, growing levels of political violence and a number of workers occupations. 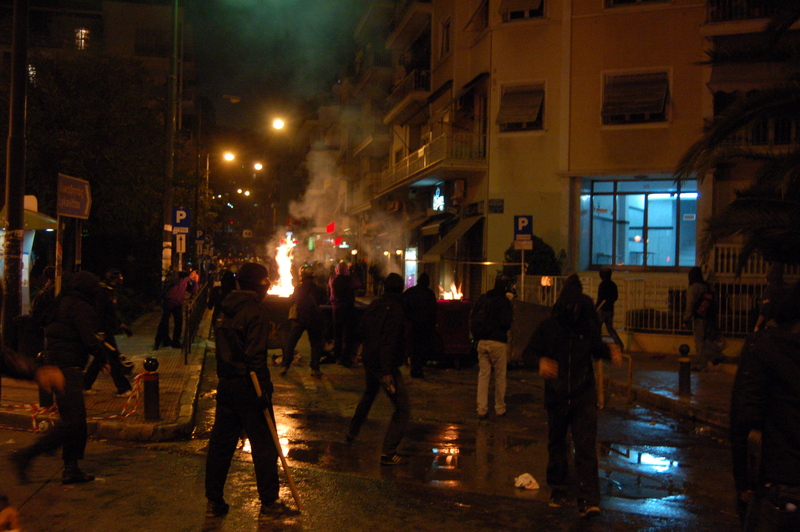 The mood on the streets of Athens is tense, with visible homelessness and a constant police presence. All of the banks around Syntagma square are closed because they have been smashed or burnt down. At the anti-austerity protests there is a level of militancy that I have not witnessed before. Many people bring gas masks because the police always use tear gas and on numerous occasions this year central Athens has resembled a warzone. You see people chiselling stones out of the footpath to throw at the police and groups of hooded protesters destroying symbols of wealth. Yet even in this context the Greek indignados movement has managed to remain largely peaceful. For many see the violence as counterproductive and point to the growing number of number of workers occupations as the way forward. For example, in November the electricity workers union went on strike and occupied an office building that controlled electricity administration in protest against privatization and rising prices. On the third day of the occupation workers refused to carry out an order from the government to cut off electricity to people who did not pay the new fee. The leader of union, Nikos Fotopoulos stated “electricity is a social good and we would rather go to jail than cut off electricity to poor people.” There have also been occupations of hospitals, schools and universities, and the movement for change shows no signs of stopping. 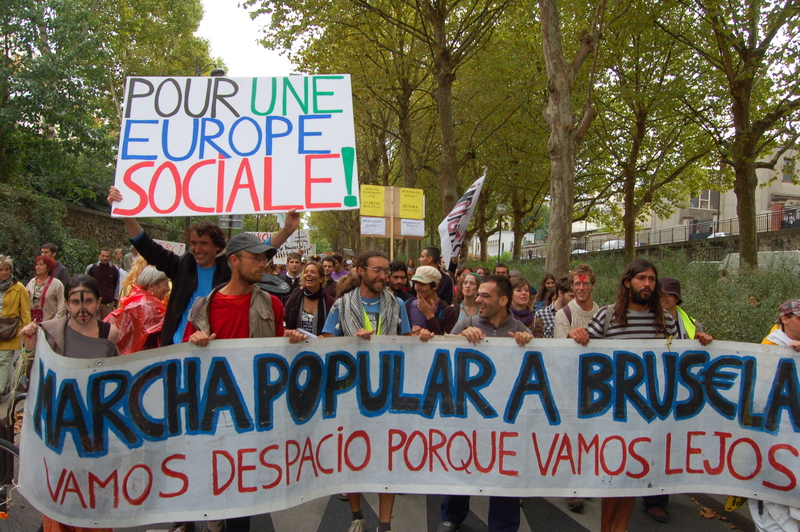 On the 7th of October, after over two months of walking, the march of the Indignados arrived at the European parliament in Brussels. 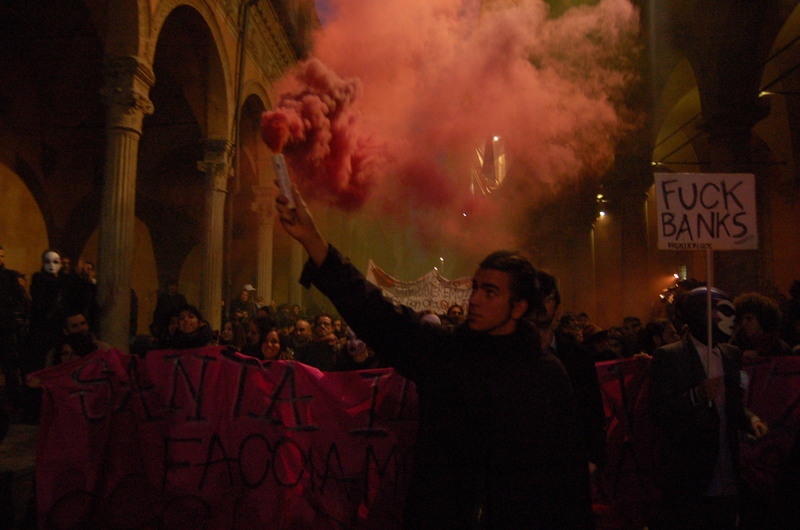 The movement occupied an abandoned university complex and put on a ‘Conference of Alternatives’. Workshops, activist trainings and assemblies were held, as the building was transformed back into a centre for learning. The old administrative office on the fifth floor became the international media centre, communicating and co-ordinating the international day of action on October the 15th. Social networking sites, such as facebook and twitter were fundamental tools in organising this action. They provided the means to communicate with large numbers of people across the globe. By October the Spanish movement’s facebook group, ‘Real Democracy Now’ had over 400,000 members and the Occupy Wall st. around 250,000. There were also thousands of important smaller twitter hash tags and blogs that provide updates on local occupations, like ‘Yes We Camp’ and #occupybristol. The website www.occupytogether.org played an important role in collating all of these different platforms into one central international webpage. It created an easy to use interactive platform, where people could create, plan and view information about the occupations happening all over the world. Many of the occupations across Europe have been brutally repressed by the police; with people arrested at occupy Berlin, Paris and countless others. Yet in Amsterdam, London Frankfurt and many others cities protesters have successfully occupied public spaces for weeks now. The occupations provide the functioning example of the alternative world the protesters want to create. They are spaces where decisions are made through direct democracy, with people sharing skills and working together. At many occupations there is free food, childcare centres and music performances. Occupy London has even created a tent university, which holds regular lectures from academics in an attempt to highlight the importance of free education. It has received a lot of media attention because the occupation is situated right next to St. Paul’s church, which has allowed the movement to build new forms of solidarity. Priests have resigned at plans by the church to violently remove protester and other Christian groups have vowed to defend the occupiers by creating a prayer ring around the site. Occupy London has also tried to link up with other anti-austerity movements. For one of the first motions passed by the general assembly was a statement of solidarity with the planned general strike and student protests against tuition fee increases. The occupy movement has had a profound impact on the political situation. In a time of crisis it has captured people’s imagination and brought them out on to the streets to demand change. As winter approaches in the northern hemisphere and temperatures reach freezing point, camping in public squares becomes more difficult. The movement has started occupying abandoned buildings and is trying to expand beyond the physical occupations, by starting up peoples assemblies in local communities. 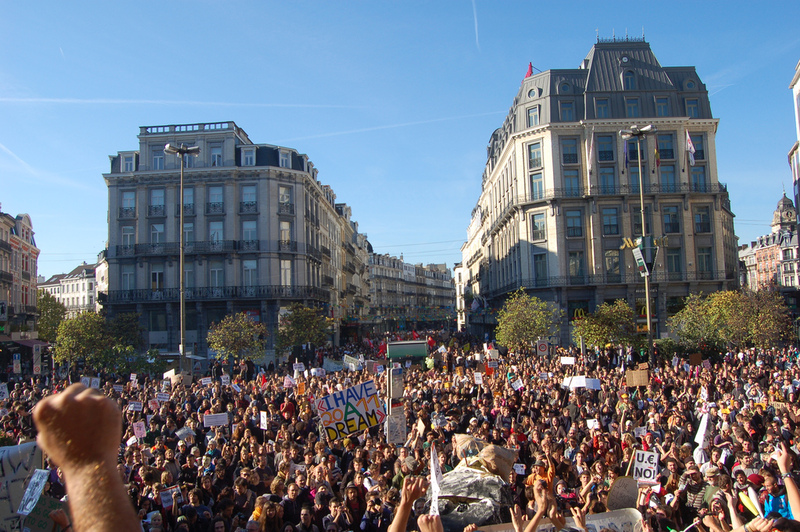 It is hard to predict what the future will hold for the occupy movement, yet it is certain that this new and powerful social movement continues to grow across the world in 2012.